The King of D. starts out a Kaiba-themed week on CoTD. Newest version of “Lord of D.”, King of D. has got the same stats as its predecessor, but instead of the protection that Lord of D offers, King can ditch a spell/trap to search out a card that Lord of D. can use or a dragon support card. King of D. is the first card for the Blue-Eyes deck that can search out The Flute of Summoning Dragon and The Melody of Awakening Dragon, as well as a new card for the archetype: Dragon Revival Rhapsody. The search ability is great to get through the deck faster and swarm with your big dragons, but the lack of protection Lord of D. offered has to be offset in some way. Also, only a Normal Summon triggers King’s effect, which is a small negative. A pretty decent card the archetype could play around with if they use multiple copies of the cards King of D. searches out. The King of D. is a Level 4 Dark Spellcaster-type monster with 1200 Atk and 1100 Def. While the stats are bad the effect is good. When Normal Summoned, this D. Shredder lets you discard any Spell or Trap Card to search 1 of three Spells from the deck to your hand. In my mind, the only one worth anything is Melody of Awakening Dragon. Flute of Summoning Dragon will work with King because he changes his name to Lord while on the field. But Flute is still bad if you don’t have the dragons in hand. Dragon Revival Rhapsody is the new Spell Card that we’ll get into tomorrow, but Melody is still my pick in a Blue-Eyes Deck. Having the options is nice, but at least Lord provided protection. There are better Normal Summons in the deck but The King of D. is definitely worth considering. Alright, I know we are reviewing The King of D., but let us all be mature here. Still wonder why they can’t just go with The King of Dragons. The King of D. is a Level 4 Dark Spellcaster with 1200 ATK and 1100 DEF. Stats are pretty lackluster for a Level 4, but I have seen worse. Type and Attribute are pretty good if you ask me. The King of D. is treated as Lord of D. while on the field so it can be another option to control for The Flute of Summoning Dragon. Speaking of The Flute of Summoning Dragon, when The King of D. is Normal Summoned, you can discard a Spell/Trap to search for either The Flute of Summoning Dragon, The Melody of Awakening Dragon, or Dragon Revival Rhapsody from the deck. We will talk about Dragon Revival Rhapsody later, but The Flute of Summoning Dragon is solid if you have some Dragons in your hand and The Melody of Awakening Dragons can get you to some pretty big Dragons itself, especially Blue-Eyes White Dragon and Blue-Eyes Alternative White Dragon. The card isn’t broken, but it is pretty good for a Lord of D. retrain. Solid for Dragon Decks. Just kinda wish they left the protection for Dragons that Lord of D. gave. Lord of D gets a successor many years later and the innuendos continue. 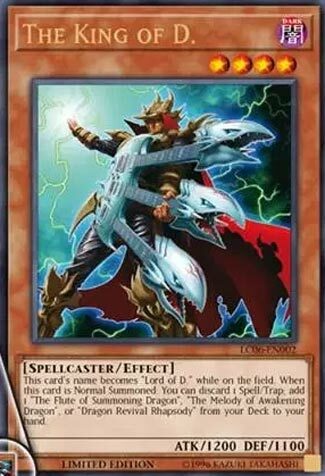 I’m glad after many years Konami finally recognized the problem with the original Lord of D. As a monster with weak stats that depended on another card to be viable at all, it was very situational. However, the problem is fixed here by allowing him to search. I don’t have a lot of praise for the design of cards which basically just try to provide card advantage on summon to compensate for their weaknesses, although a +2 is kind of needed to justify a monster with next-to-no field presence and a situational -1 Spell card. The King of D. opens our week (which should at least give you a clue to the theme of the week) and he mirrors his counterpart, Lord of D. at least in stats. He though becomes Lord of D. while on the field. He lets you add one of three cards (Flute of Summoning Dragon, The Melody of Awakening Dragon, or Dragon Revival Rhapsody) from your Deck to your Hand at the cost of a discarded Magic or Trap card, so the speed here and combo potential is nice for sure. Though he only gets the effect if Normal Summoned. He’s quicker than Lord of D. absolutely, just without the protection. Maybe we’ll get another down the line, or a Link or Fusion of the two. Still not bad though for a Dragon player.